After finishing the integral course on October 9th, our program had a brief pause before heading into Michaelmas term. 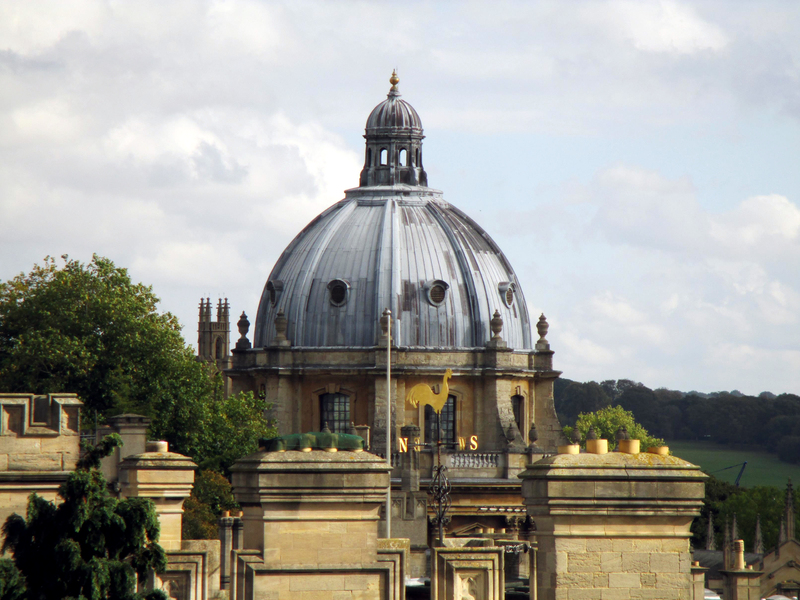 Each of the three Oxford terms (Michaelmas in the fall, Trinity in the winter, and Hilary in the spring) is eight weeks long. During each term, most undergraduate students take one major and one minor tutorial. For major tutorials, students and their tutors meet weekly in a one-on-one (or more realistically given the ever-higher student/faculty ration, two- or three-on-one) session. In the prior week, students are given an essay topic and a reading list for each meeting and must typically produce a 2,000—3,000 word essay. Minor tutorials are exactly the same save for meeting every other week. At CMRS, each student takes two major tutorials and one seminar course (a weekly discussion seminar with readings and a 4,000 word research essay in the last week) during term time. In other words, they have us working harder at CMRS than the normal Oxford student. Indeed, my tutor from Wooster College informed me that when Oxford students complain to her about their workloads, she tells them about the poor Americans down the road at CMRS. 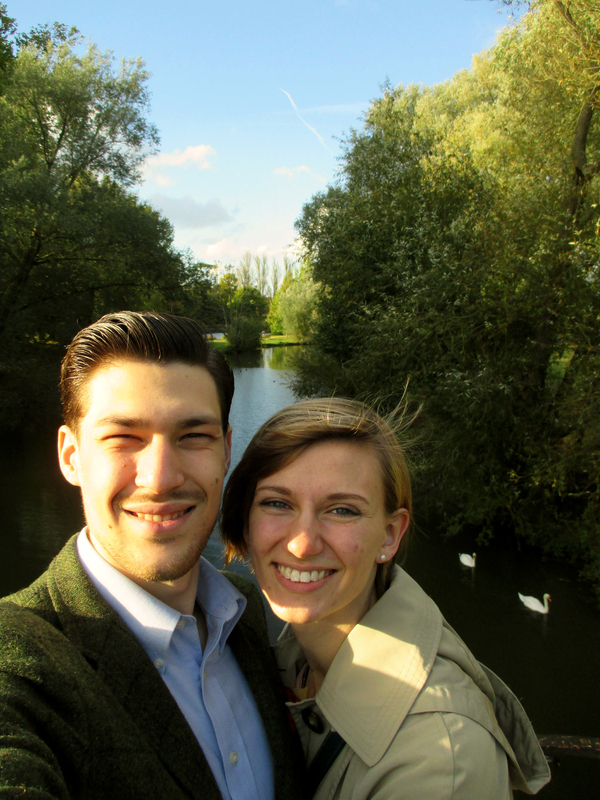 So while Oxford began to awaken over the long weekend of the 10th-12th of October in preparation for Week 1 of Michaelmas, Bekah and I decided to give ourselves a much-needed break before the term proper began. 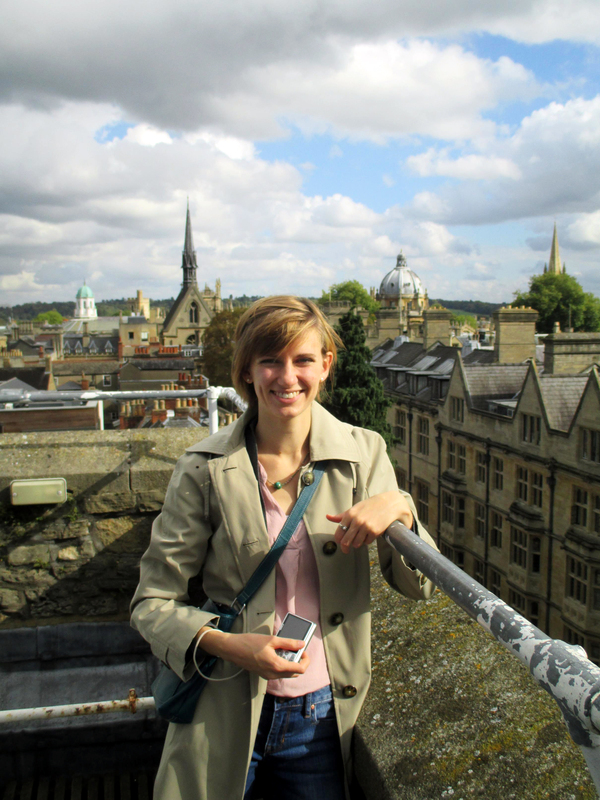 While most of our peers fled the island to Europe and beyond, we elected to stay in Oxford and explore some of the city afresh (and revisit some favourite spots). Besides, we had tickets for a concert in London on Sunday and needed to stay in the area. Friday morning we awoke early and headed to Magdalen College by way of the church of St. Michael of the North Gate’s Saxon Tower. 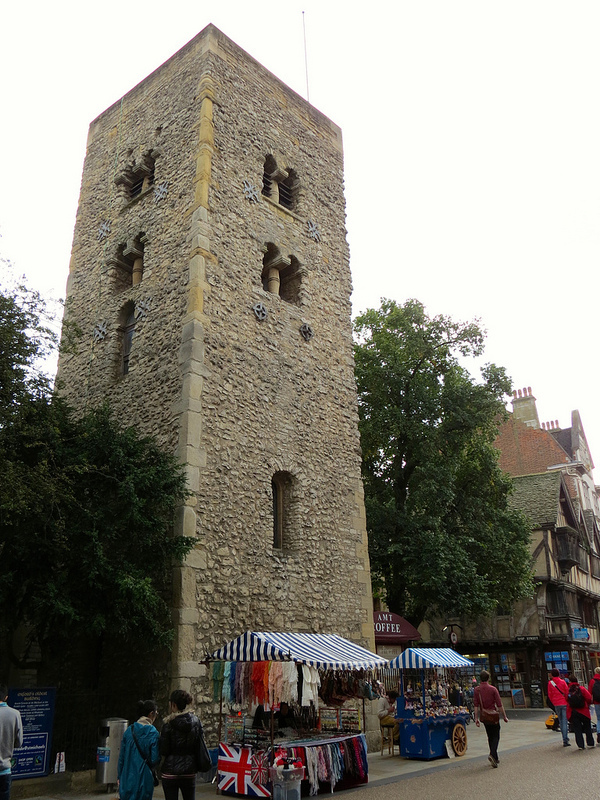 The oldest building in Oxford, the tower was built before the conquest in the beginning of the eleventh century. 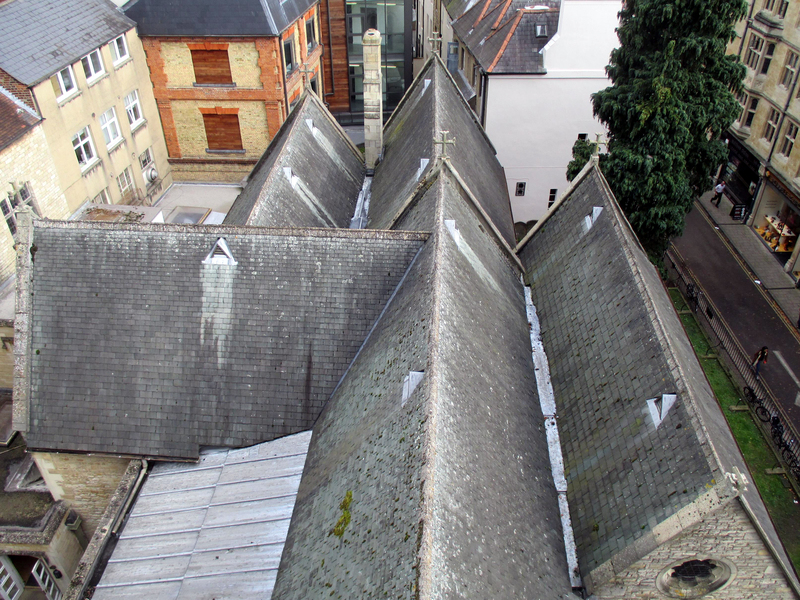 The attached church is a hodge-podge of construction over the years hence with the most recent renovations occurring in 1833. 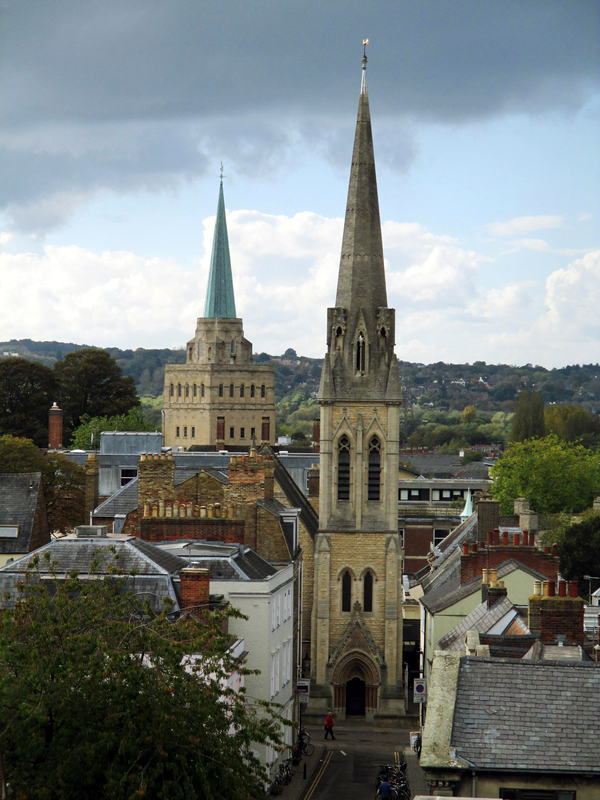 During the reign of Mary I, the church was connected to the Bocardo Prison, in which the Oxford Martyrs — Bishops Ridley and Latimer and Archbishop Cranmer — were kept before their executions at the stake in 1555 and 1556 (a small stone cross, set in the Broad, marks the spot where they died). 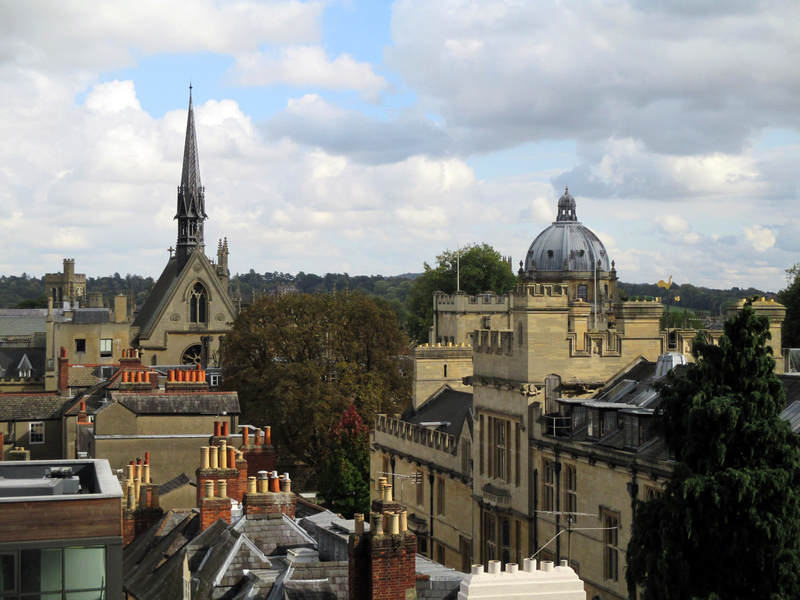 In that time, the church was located at the north gate of the city walls; the church is still there of course, but Oxford itself has expanded far beyond its original fortifications. Climbing the tower cost £2.50, but the view from the top is well worth the expense. 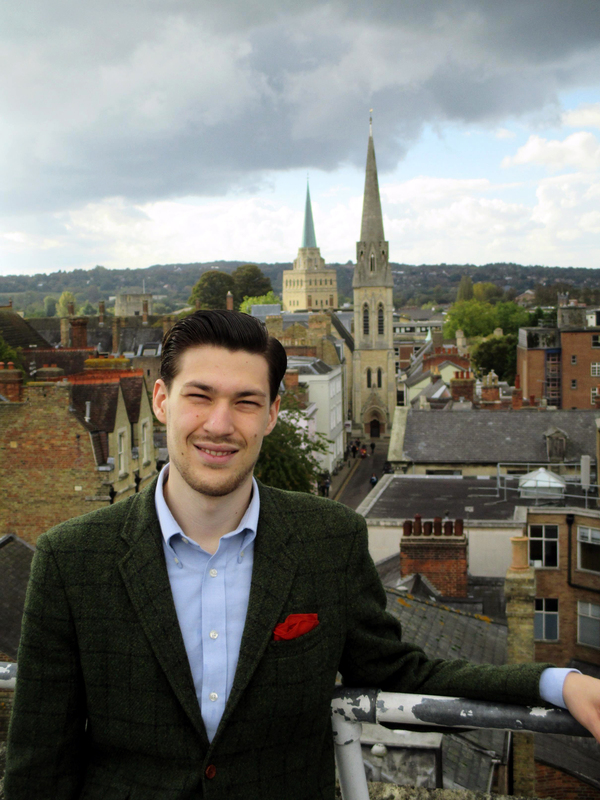 Only Carfax tower, a few blocks to the south, approaches the height of Saxon tower, and while several of the church steeples in Oxford are taller, they are difficult or impossible to ascend or (as in the case of St. Mary the Virgin) have a limited range of view at the top. 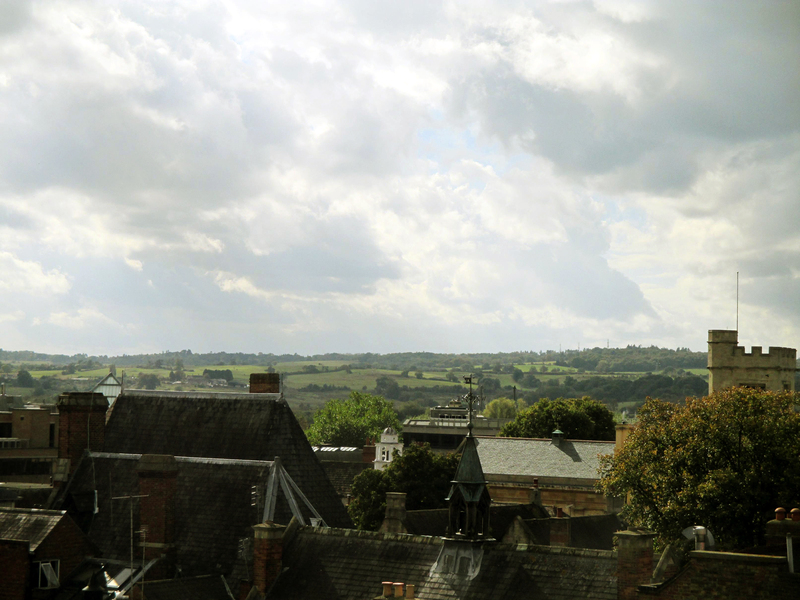 From Saxon Tower, it’s easy to see why Oxford is called the city of dreaming spires. In every direction, steeples pierce the sky, needling above the plebeian buildings which surround. That morning exhibited odd weather. Sprinkling in starts, cloud-covered in fits, with dazzling sunshine breaking through the grey at all points, the light at the top of the tower was both golden and harsh, casting sharp shadows across the buildings. As the day wore on, the weather mellowed, leaving an autumnal glow with frosting-whipped blue skies and a crisp wind. I’ve tried to caption the photos to pick out the most prominent landmarks. The video panorama should tie all of the pieces together. 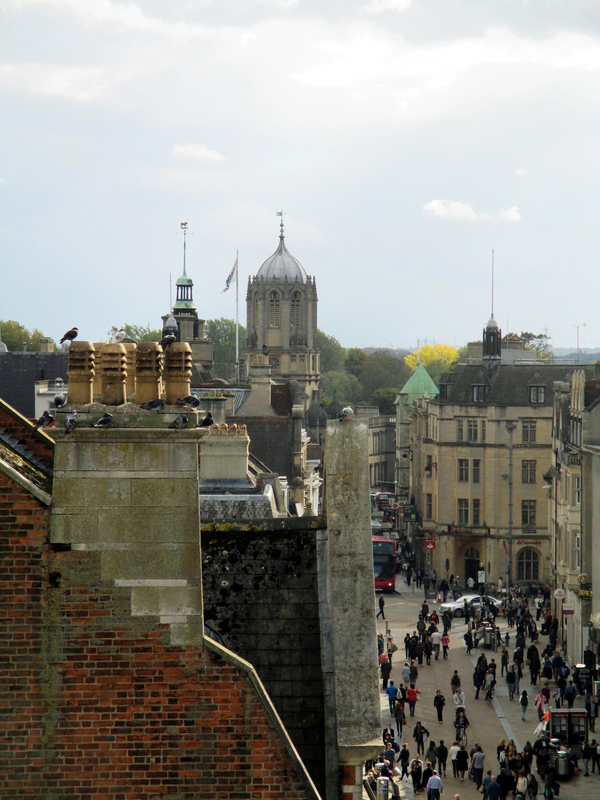 After the tower, we walked back south down Cornmarket then east on the High Street to Magdalen College. 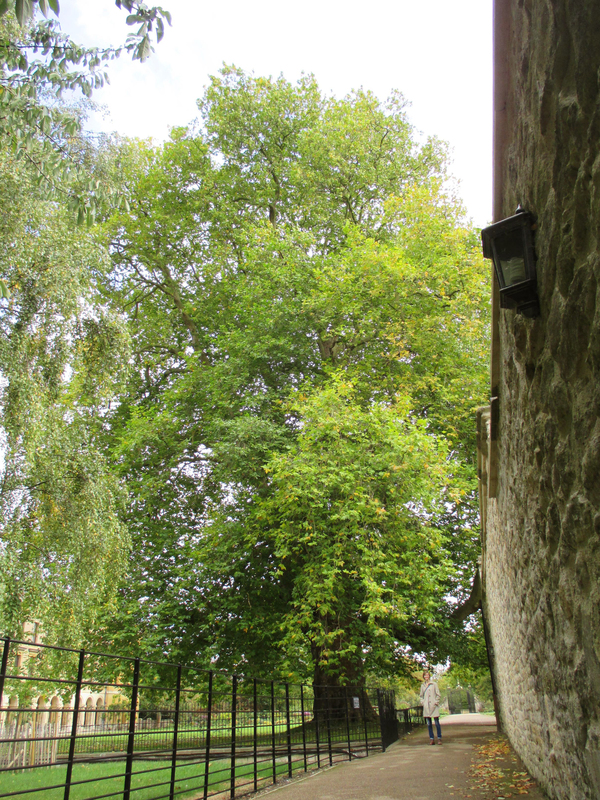 I’ve written about Magdalen before, and my second visit only confirms what I thought then: Magdalen is Oxford’s most beautiful college. We went to Magdalen with the intention of taking in Addison’s Walk, the Deer Park, Fellows’ Garden, then crossing north into the University Parks. After stopping at Sainsbury’s to pick up supplemental bread, cheese, and grapes for lunch, we headed to the college. Before walking the grounds though, we wanted to find the chapel; it had eluded us on our previous visit. This time, we did find the chapel area. And, although we were unable to access the chapel proper, we were able to look in through the narthex – a beautiful area in itself. 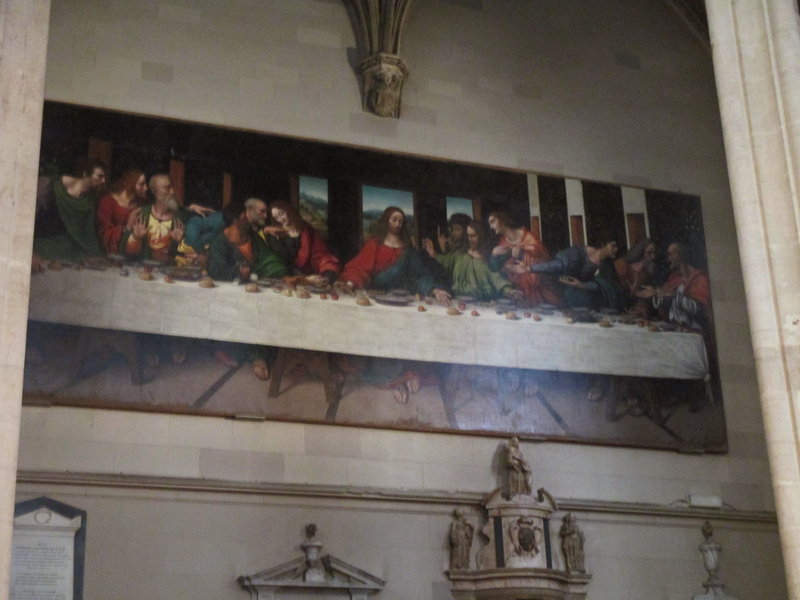 Hanging on the one side was a reproduction of da Vinci’s “The Last Supper” and on the other end was a set of stained glass. That same sepia-toned style was replicated at the back (west end) of the narthex in a larger panel. 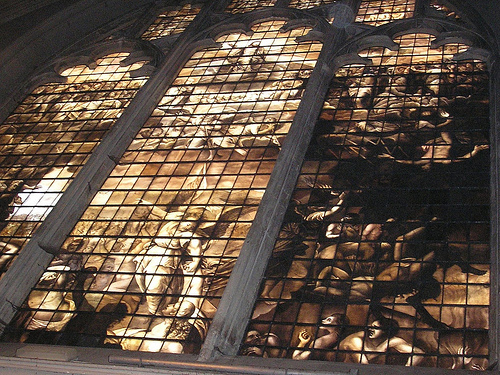 None of my pictures were able to capture the correct lighting of the glass, so I’ve supplemented them with an image I found online. Looking through into the chapel proper is overwhelming. Above the altar rise ranks of life-size statuary, topped by an enthroned Christ. 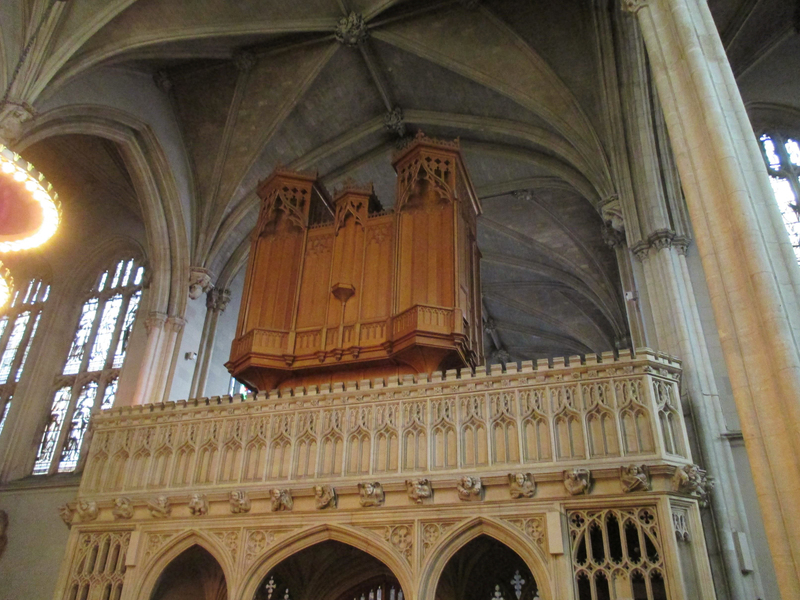 Both sides of the church are pierced with stained glass, and toward the back, the choral stalls huddle beneath the large organ. The floor, in black and white checks sets off the honeyed wood and pale stone with which the rest of the church is constructed and the glass sparks hints of colour off of the rest of the tableaux. 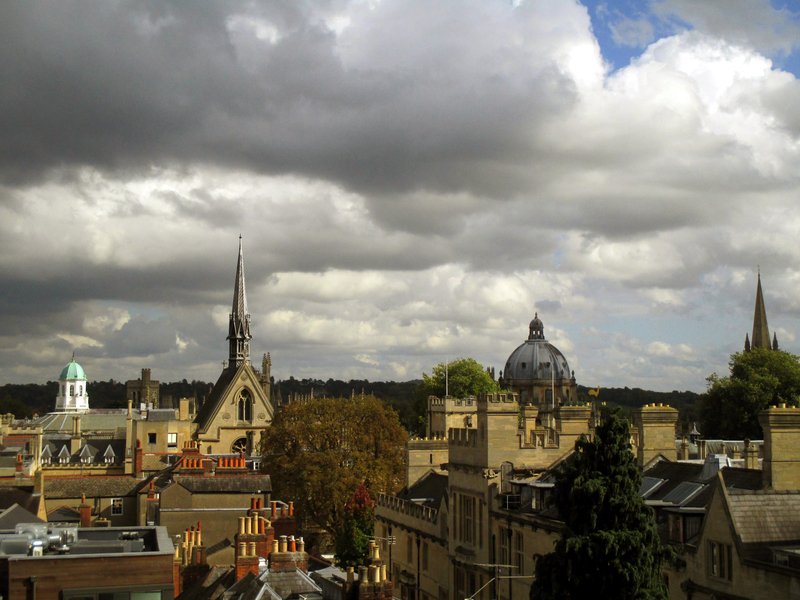 Magdalen is one of Oxford’s four choral foundation colleges, i.e., colleges whose constitutions or founding documents specifically stipulate a choral endowment for the school. 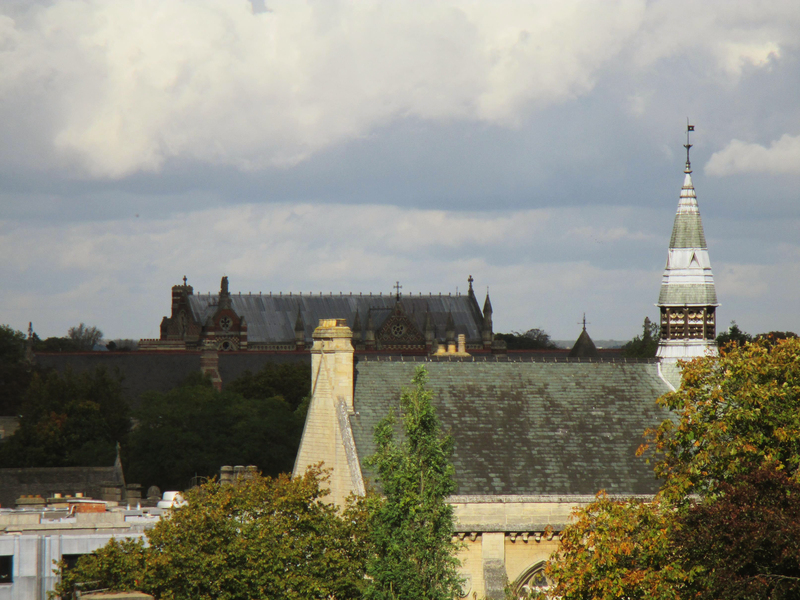 The others are Merton, New College, and Christ Church. 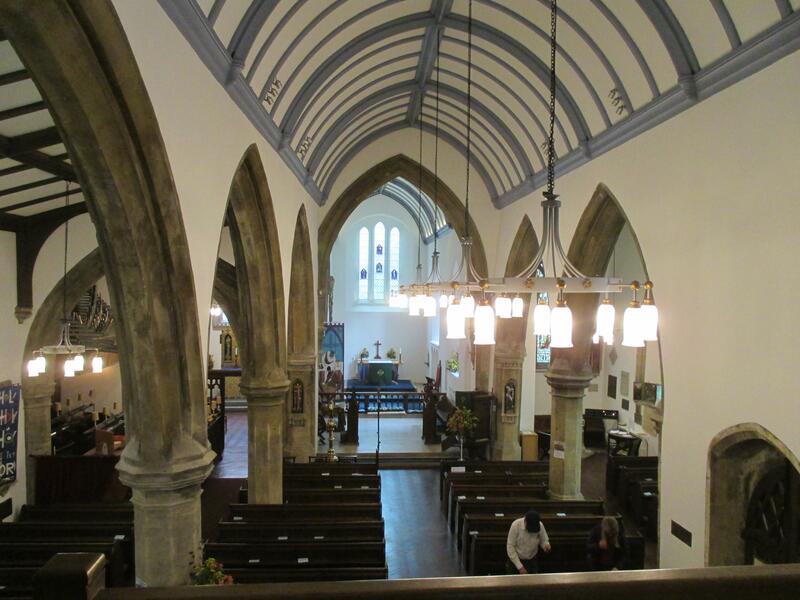 I’ve been to evensong at Christ Church, but not to the services of any of the others. 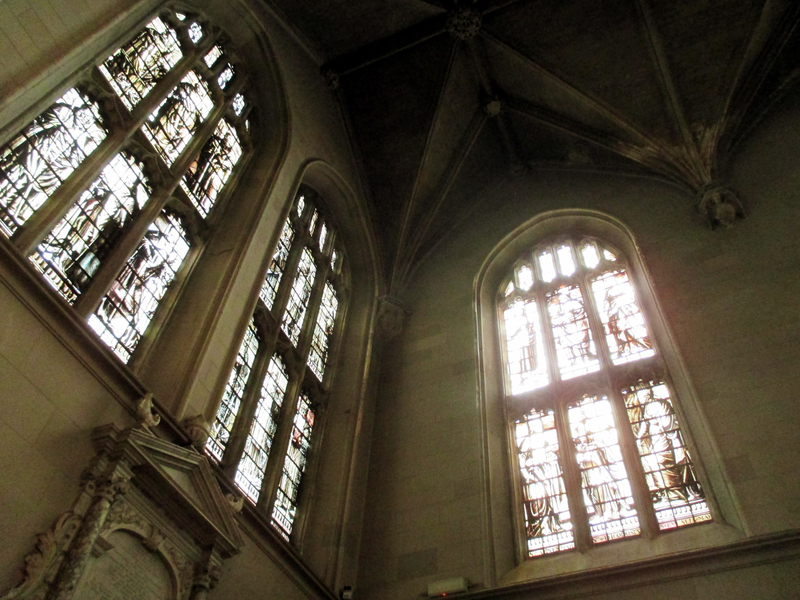 The beauty of Magdalen pushes it to the top of my list. 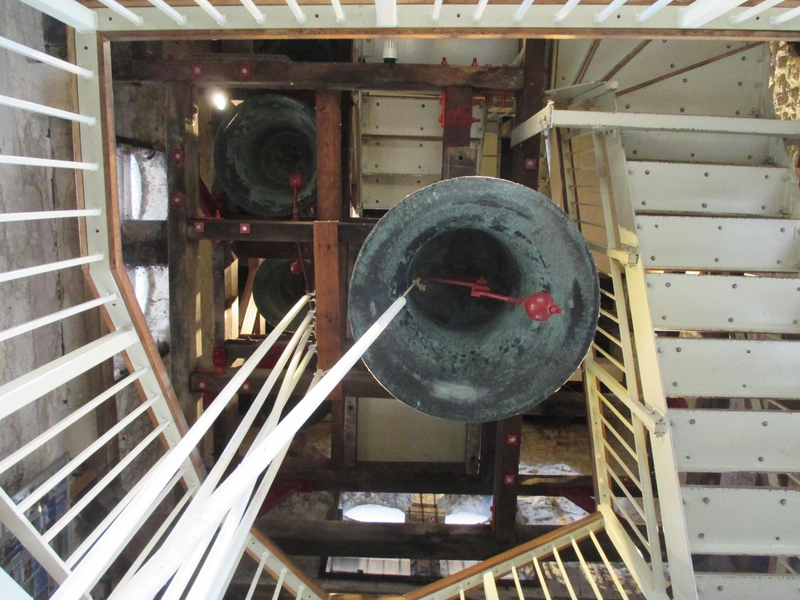 Pity I won’t be here on May first, when the Magdalen choir serenades the University from the top of Magdalen tower as they have done for over five hundred years. 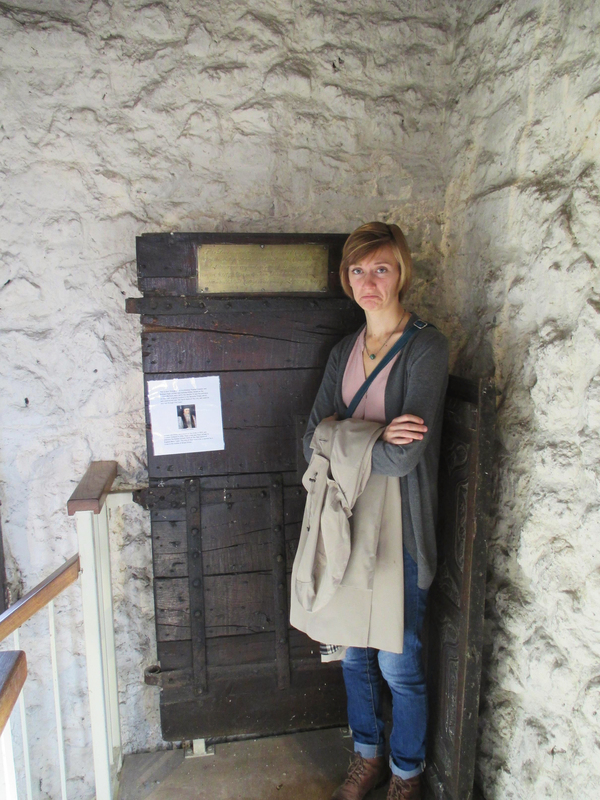 As we returned to the grounds from viewing the chapel, we came across a door marked “restricted” in the cloister halls. 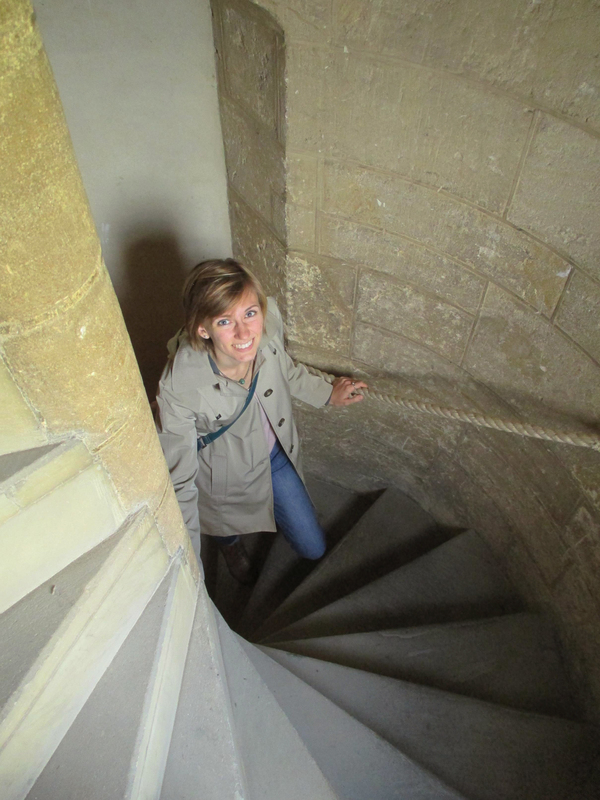 However, the door was open, and behind it was a tight spiral staircase. 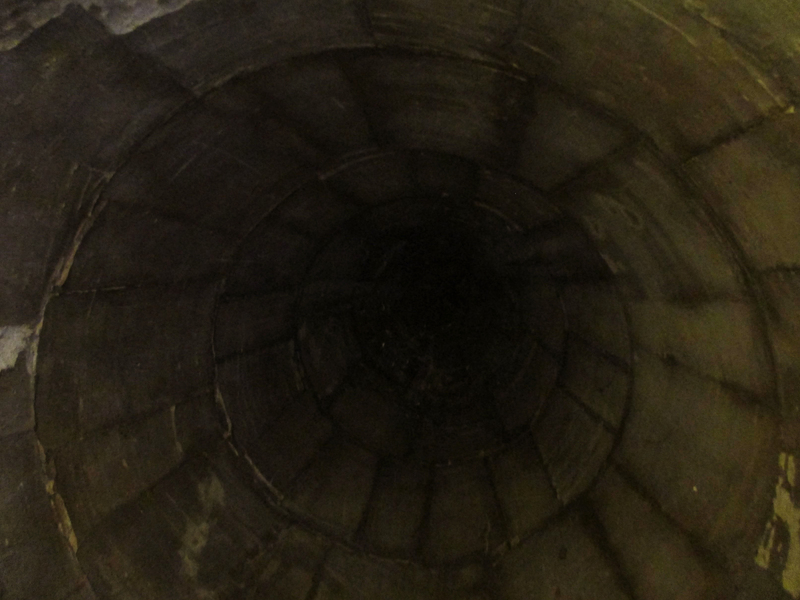 So like any curious people, we climbed, and climbed… and climbed. We passed two doors, the first to a set of private rooms, the second to the entrance for the Old Library. We disturbed neither, not wanting to risk ejection. Eventually, we reached the top and found a locked door to the outside. 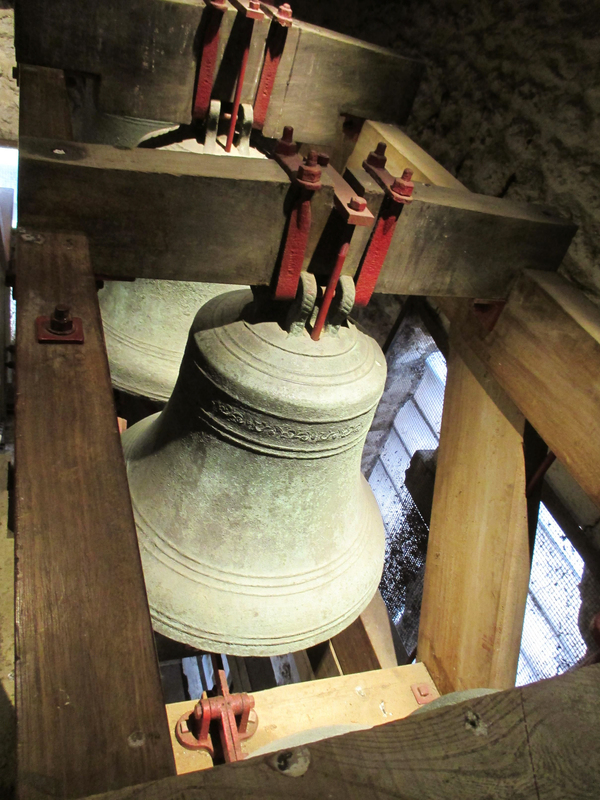 After a quick photo into the conical roof (somewhat fearful of bats), we descended again and looped the cloisters to see what it was exactly that we had climbed. From the other side of the quad, it was apparent that we’d been inside the corner tower of the gatehouse to the quad. Called Founders Tower, the area is normally restricted, so much so that I’ve been unable to find any photos of the interior online. 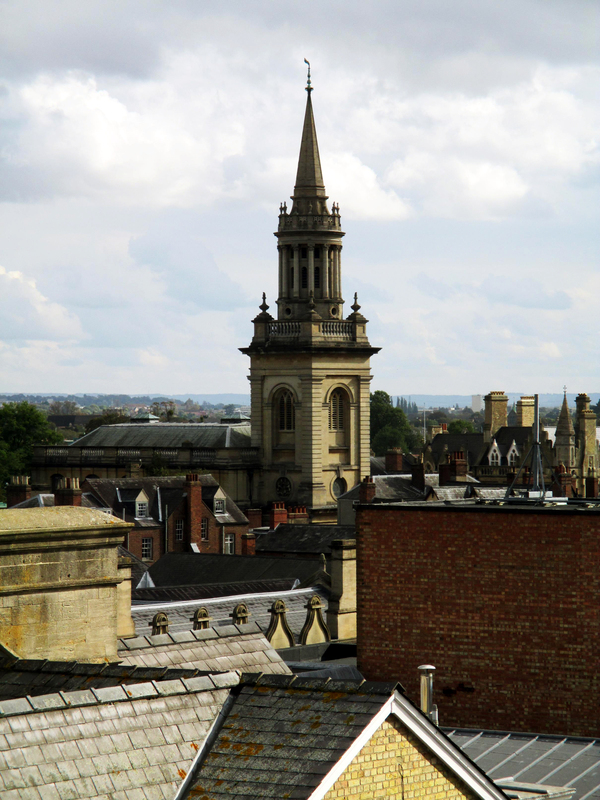 The tower is the second highest at Magdalen after the Great Tower (also called Magdalen Tower). It was built between 1470 and 1510, as were the cloisters which surround it. 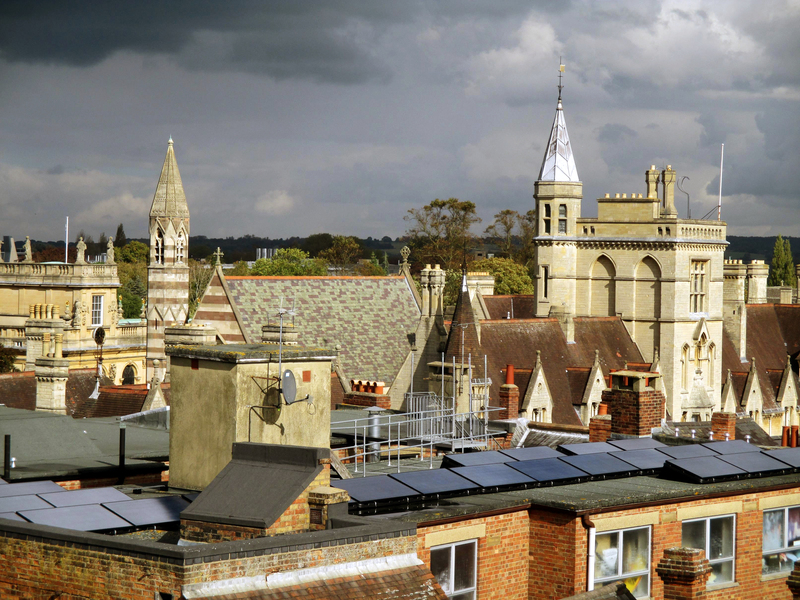 Only two of the present buildings date back to the college’s 1458 date of founding, but nearly all are centuries old. It’s fitting that at a place like Magdalen “New Building” would date back to the 1840s – practically antiquity in America. Speaking of New Building… from the cloisters we walked out into the grounds again. New Building in its yellow finery was a perfect contrast to the green grass and blue sky. While I’ve lightly edited some of these photos, the ones of New Building remain untouched, straight out of my cheap Cannon Powershot. It didn’t hurt that the light was spectacular that day — evidence, for example, the striking animal shadows cast by the statuary in the cloisters. 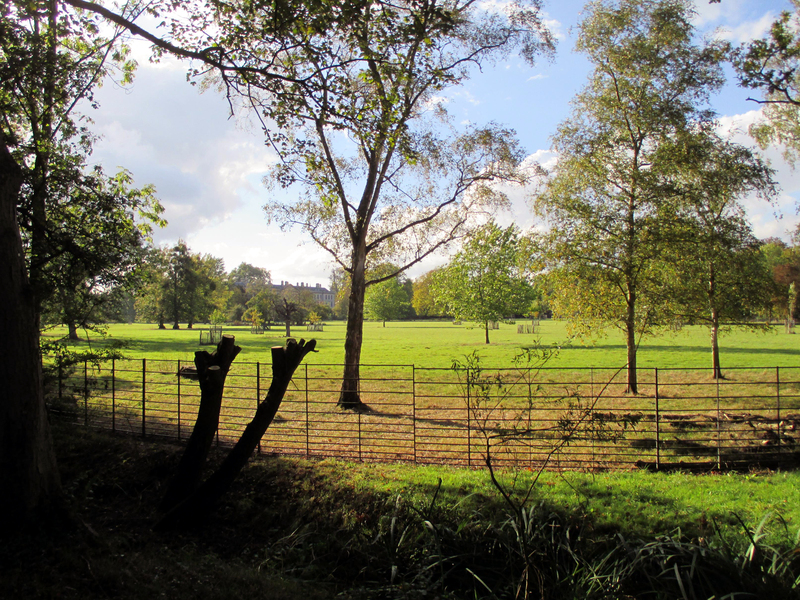 Through the gate; across the River Cherwell; onto Addison’s walk — this gives me an opportunity to correct an error I’ve been making all the way up to the writing of this post. The area I’ve been referring to as “Deer Park” is actually called the Water Meadow. Deer Park is an area directly west of New Building (the photo of the tree above is at the southeast corner of Deer Park). At this point, it may be helpful to refer to a map of the area. Like many things in Britain, the nomenclature is confusing because, well, Deer Park has no deer and Water Meadow is full of them. I don’t know whether that distribution is seasonal — Deer Park runs up against various college buildings among which may be a shed; perhaps the deer winter in the more sheltered Deer Park — or whether this is just another example of the British constitution (something I’ll write more about at length soon). At any rate, I’m not going to correct my previous references to the two areas, but I will use the correct terms from here out (note that some of the videos may be titled incorrectly; I don’t have the inclination to change all of them). I’ll let the old references stand as a monument to British idiosyncrasy. 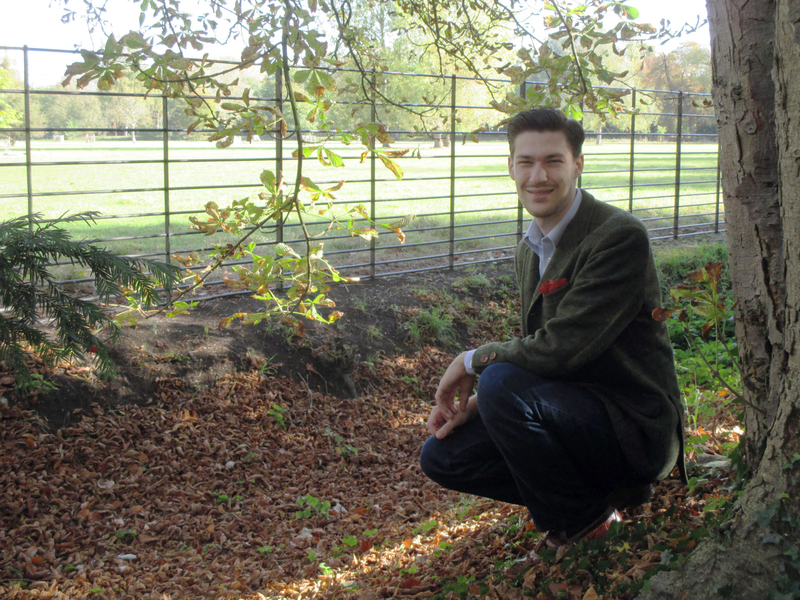 I’ve written before about Addison’s Walk, a walk which circumnavigates the inverted triangle island that is Water Meadow. 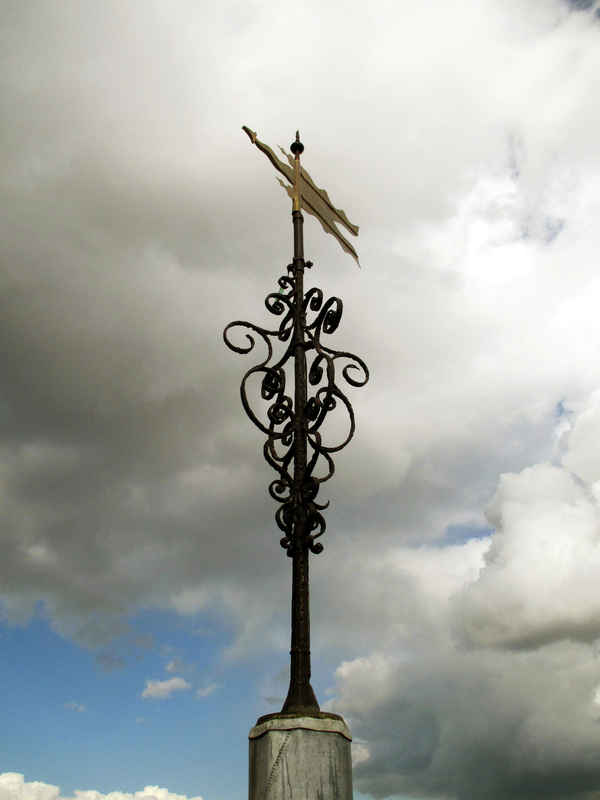 At the top right point of the triangle, one can cross the Cherwell and continue north into the strip of land called Fellows’ Garden. This is what we planned on doing, then proceeding across the Magdalen recreation ground to Marston Road and further up to University Parks. The deer were out in force that day, wagging their tails indefatigably. We even spotted the stag again, this time resting under a tree. I’ve included a short video of the deer below, but I know at least one of my readers who has an interest in animals will appreciate more than a single paltry video; I’ve posted the rest of my deer videos to a separate page. For many hundreds of years, Magdalen had a tradition wherein each time a member of the academic staff died a deer would be caught, slaughtered, and served at dinner to the college. 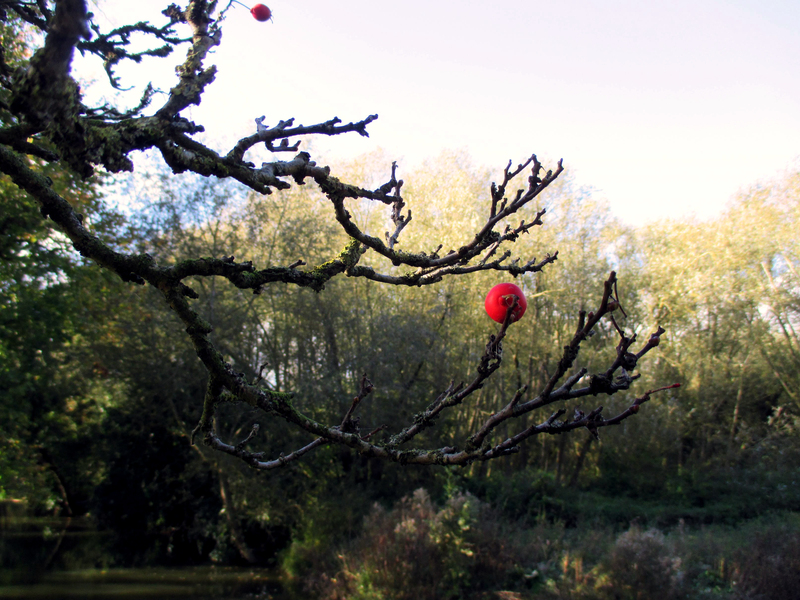 In recent decades, Magdalen has discontinued this tradition. Addison’s walk is beautiful at any time, but more so during autumn. Much of the trail is enclosed by trees on either side, the Meadow on one side, the river on the other. The sun pierces through the foliage, leaving dappled spots on anything which walks beneath. I’ll let the photos speak for themselves. 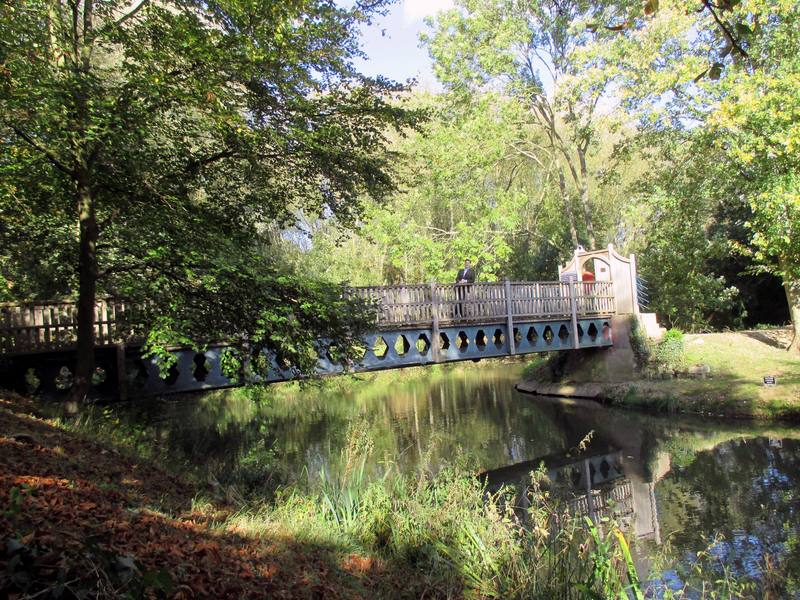 Shortly, we came upon the bridge leading to the Fellows’ Garden. Unfortunately for our plans, a sign on the bridge informed us that there is no exit from the Gardens; we would have to come back out the way we went in. We decided to go anyway and see whether we could hop a fence or some such malfeasance. Unfortunately, fence-hopping at the end of the garden proved impossible. Tall metal fences with spikes tend to discourage such activities. 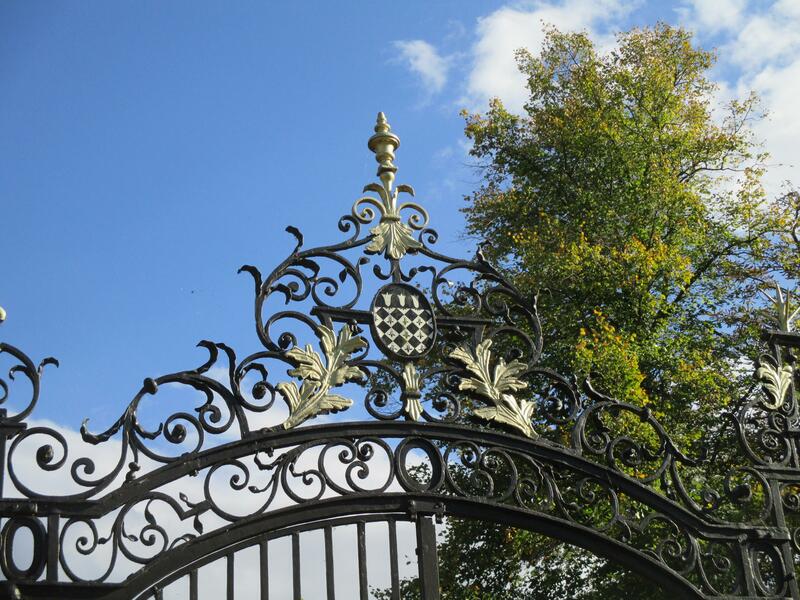 But instead of abandoning our plan to go to University Parks, we retraced our steps out of the Fellows Garden and completed our loop on Addison’s Walk around Water Meadow, this time approaching the gate to the college from the south (when we departed the gate, we turned north). Along the way were a number of interesting plants and berries. One thing I’ve noticed about England vis-a-vis Minnesota is just how many more berries there are. Back home, one may find the occasional raspberry bush or bramble, and more often trees and bushes with small red, watery berries, but both are sporadically seen. Here, almost every street has a berry-producing plant. The walk along the eastern shoulder of the Addison’s Walk, around the southern point of the triangle, and back up to the western shoulder contains more than usual. 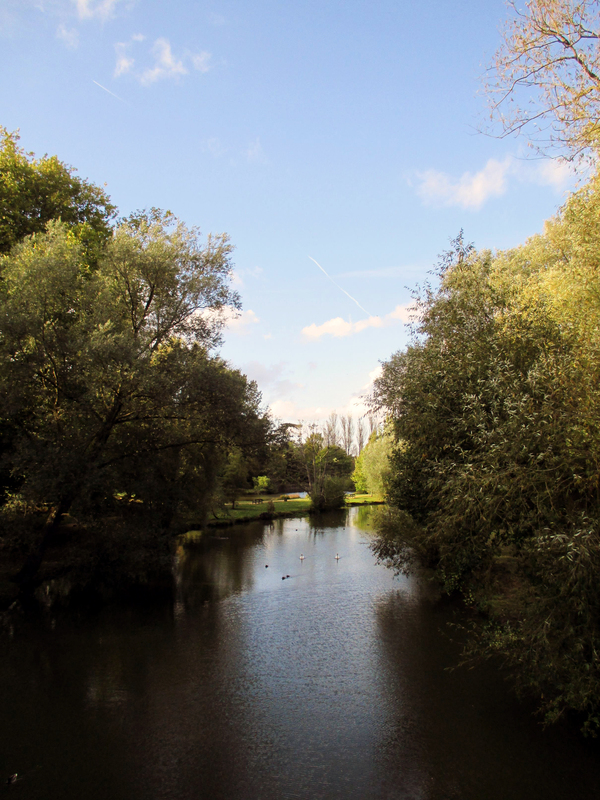 University Parks were similar in character to the Magdalen gardens, with one key difference: while the Magdalen gardens rely seemingly entirely on native English flora, the University Parks have integrated imported plants. At least, that’s how it appears to this very-much-not-a-botanist. The Parks were a favourite of J.R.R. Tolkien, and it’s easy to see why having read his work. 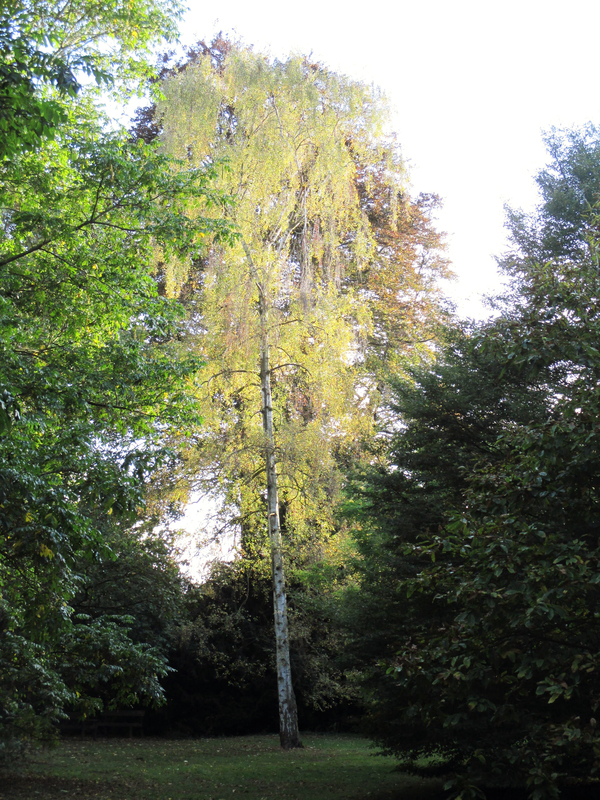 Middle Earth’s mallorn trees live in University Parks, among other influences. Tired from the long day of walking, Bekah and I retired to a bench for a time, only to find that our seat was dedicated to the memory of the professor himself. Perhaps that was fitting; Tolkien was a fellow at Magdalen college too, so that bench stitched the two halves of our day together. After sitting a while, we looped around the north end of the Parks and came upon a young family feeding the waterfowl by the large pond. Ducks, seagulls, and even swans appeared for the feeding. We resolved to return the next day with our own loaf of (rapidly expiring) bread to do the same. As the day drew to a close, we headed back across the park, eschewing the paths this time. 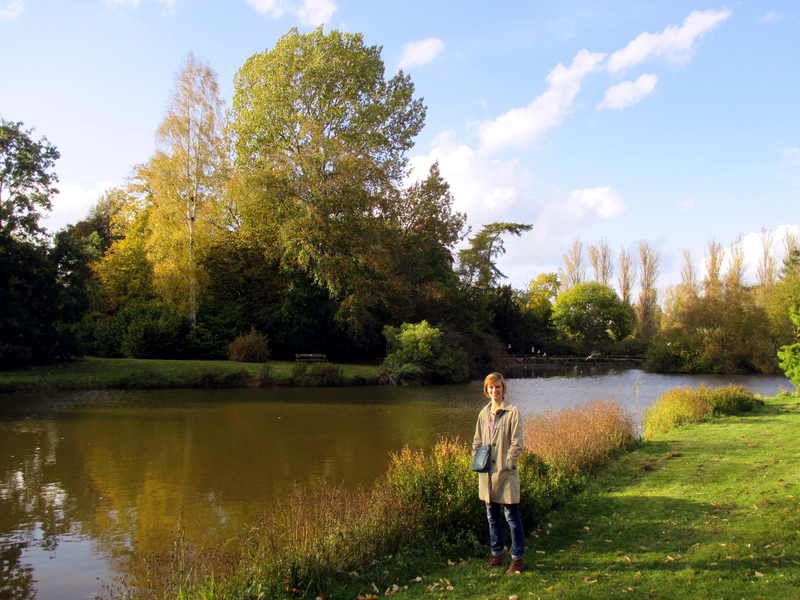 After all, University Parks are seemingly one of the only places in Oxford where one can walk upon the grass — an opportunity not to be missed. The light grew steadily stronger and more golden, as if liquid metal was diffusing across the landscape. One particular tree practically shimmered in yellow-white light, its leaves spinning in the breeze. 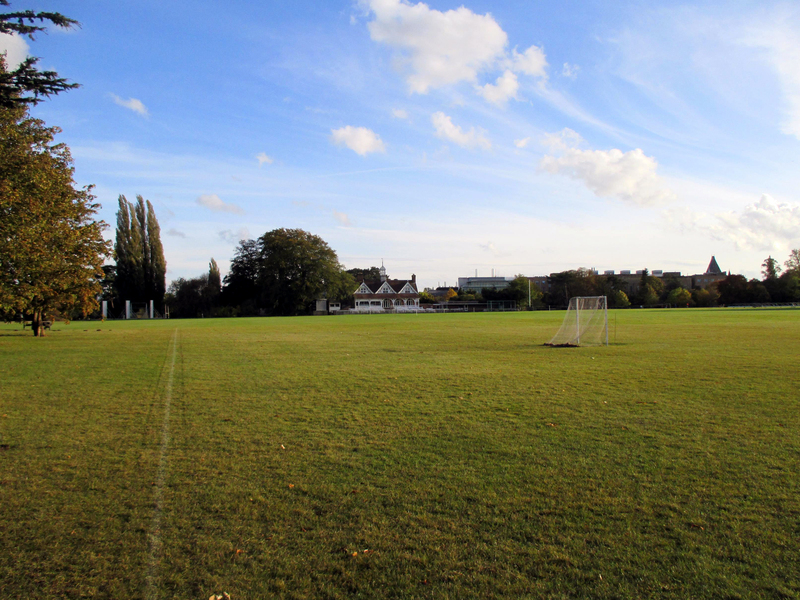 And as we headed back to the park gate, the view across the sports field was even better. After being among trees for so long, suddenly emerging into such a wide, open space — blue sky and setting sun overhead — was liberating. The little club house at the end of the fields with its white wood gables seemed to suggest New England more than the old country. 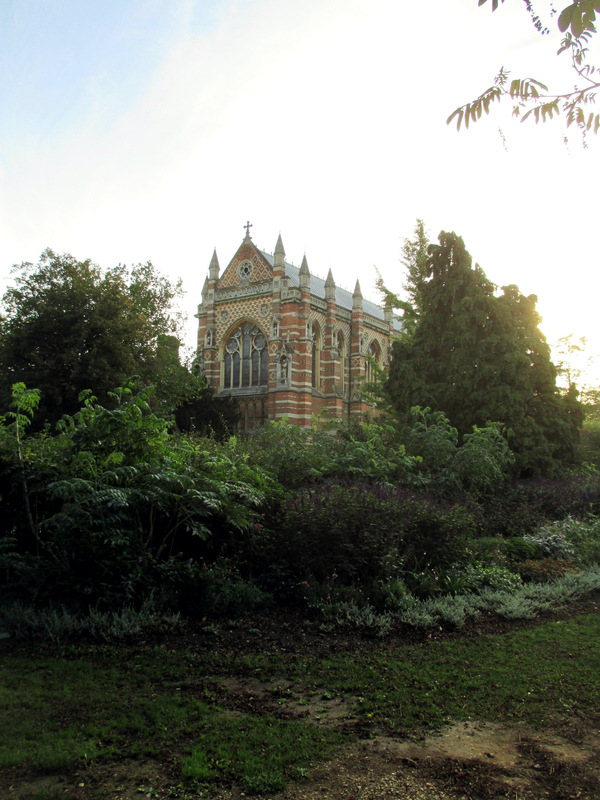 As we approached the exit, the Keble chapel came into view over bushes. With the light at the fevered pitch it achieves just before dimming, the chapel rose out of the ground. The shadows which clung to its lower parts already suggested that by the time Bekah and I would have returned to St. Michael’s Hall, Keble would be sunk back into the medieval dusk it had inhabited as early as that morning.